Super Bowl Party Ideas - Super Bowl Snacks & More! Looking for super bowl snacks ideas or super bowl party ideas? Score big with these simple tips! Super bowl Sunday is a holiday in America. People get together, drink beer, eat fatty foods, scream at the tv and celebrate like there's no tomorrow. It's so exhilarating! Before you explode with excitement, read the below how-to information for organizing a super bowl party. You'll find 5 fantastic tips for simplifying your hosting duties and some great product suggestions. Enjoy! 1. Serve finger foods. Hosting a super bowl party doesn't mean you have to miss the game! Create super bowl snacks that are easy to make and don't keep you confined to the kitchen. Serve everything buffet-style, and everyone can get what they want when they want it. For the actual food, you could get grub delivered, buy frozen items that can be reheated/baked in the oven or make super simple recipes like dirty shrimp in butter-beer sauce or jalapeno bites. Yum! 2. Get festive. This is definitely an event to show your spirit and one of my favorite super bowl party ideas. You could use football-themed dishware like bowls and trays or have your guests wear their team jerseys or colors. You could decorate your house for the occasion with things like a tablecloth that looks like a football field or hang streamers from the ceiling. You could do all of the above! It's fun to get creative with this, and your guests will love these finishing touches. 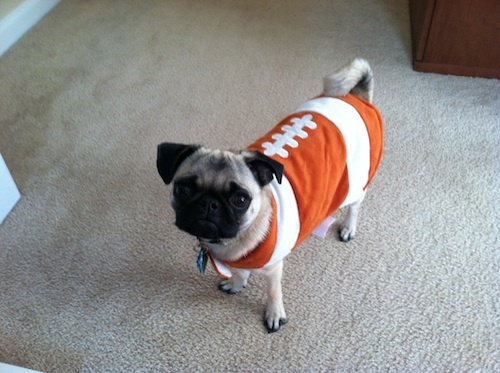 This is our Pug, Brisket, showing her football spirit! Think outside the box for some great super bowl party ideas like including your pet in the celebration! 3. Consider BYO. Have your guests bring what it is they want to drink. This way everyone is satisfied, and you don't have to worry about all the different beverage choices. Fridge space will be needed for the food, so be sure to have a few coolers out, clean, stocked with ice and ready to house the beverages. 4. Use disposables. Minimize the after-party clean up by using disposable cooking pans, plates, bowls, utensils and so on. Be sure to have plenty of napkins and paper towels out for dirty hands and accidental spills. There is also usually a lot of leftovers at parties, so purchase some disposable food containers to send your guests home with. Get creative with this and turn leftovers into party favors. For example, you could purchase football-themed doggy bags for your guests to bring their food home in. 5. Remove valuables. Between the messy finger foods, the plethora of beverages and the belligerence of football fans, it's a good idea to remove any and all valuables from the party area. Valuables can be items that are breakable, stain-able, destroy-able in any way. Move them into another room and enjoy the game!